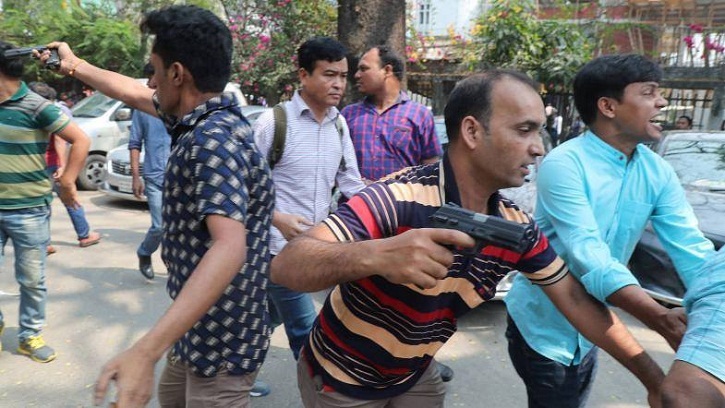 Plainclothes policemen detained Jatiyatabadi Swechchhasebak Dal president Shafiul Bari Babu from Jatiya Press Club area on Tuesday, reports UNB. A team of Detective Branch of police picked him up while he was returning home from the press club area after joining BNP's human chain programme around 11:45am. Contacted, BNP senior joint secretary general Ruhul Kabir Rizvi said he got the information that Babu was detained by the DB police. He strongly condemned and protested the arrest of Swechchhasebak Dal president and demanded his release immediately. Earlier, as part of countrywide scheduled programmes, BNP leaders and activists formed a human chain in front of the Jatiya Press Club demanding their chairperson Khaleda Zia's release from jail.